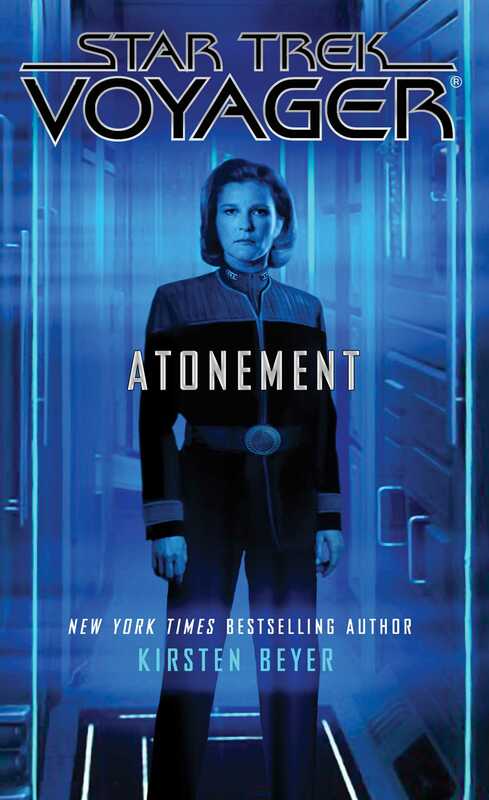 An original novel set in the universe of Star Trek: Voyager—and the sequel to Protectors and Acts of Contrition! Captain Chakotay had asked Captain Regina Farkas, of the Vesta, and Commander Glenn, of the Galen, to join him as he brought his acting first officer, Lieutenant Harry Kim, and Commander B’Elanna Torres into the small circle he intended to utilize in managing the current crisis. Lieutenant Kenth Lasren, his Betazoid ops officer, Counselor Hugh Cambridge, and Admiral Janeway’s personal aide, Decan, were also present. Both were already well aware of how complicated their mission had become in the last few hours. Torres and Kim appeared stunned and sickened by their captain’s revelations. The shock had already passed for everyone else and been replaced by mingled trepidation and determination. “Presumably with the admiral’s execution,” Counselor Cambridge interjected. “Almost certainly,” Captain Farkas corrected him. “Which we cannot allow to happen,” Captain Farkas noted. “Because we now know that whatever the Kinara’s objectives might once have been, in the last few months they have come under the influence of at least four of the original eight Neyser essences,” Torres continued. “Individuals believed to be so dangerous that their own people intentionally disembodied them and kept them incarcerated for thousands of years,” Cambridge reminded her. “And who have used their first taste of freedom to convince or coerce some of the most powerful Delta Quadrant species already predisposed to mistrust the Federation, including the Turei, the Vaadwaur, the Devore, and the Voth, to ally themselves against us,” Kim added. “Is our potential alliance with the Confederacy off the table?” Torres asked. “Admiral Janeway indicated prior to her departure that she did not believe the Federation and the Confederacy could ever form an alliance,” Farkas replied. “And that was without hearing my report on Voyager’s joint mission with the Twelfth Lamont, the results of which, in my opinion, would make any such alliance unconscionable,” Chakotay noted. “It doesn’t matter anymore,” Torres argued. “After what Inspector Kashyk—or whoever he really is—said, I’m not sure how inclined the Confederacy will be to offer assistance,” Farkas suggested. “There is no question that the first consul, Lant Dreeg, arranged for the admiral’s capture in order to force us to offer the Market Consortium the technology they requested—technology with which we cannot responsibly part at the moment—in return for aiding us in recovering our admiral,” Cambridge asserted. “We need to find out where the Confederacy stands right now,” Farkas said. “Among other things,” Chakotay agreed. “Meanwhile, the Doctor has suffered some catastrophic damage?” Torres asked. “If not sooner,” Cambridge insisted. “Demeter has yet to report in?” Farkas asked. “Demeter should have returned to Confederacy space more than twelve hours ago. If she’s not back soon, someone is going to have to go after her,” Chakotay replied. “She has no desire to be rescued, and indeed left explicit orders that we should do nothing to risk the current cease-fire,” Decan said, speaking for the first time since the briefing had begun. “That’s going to be a little hard to do while she’s fighting for her life,” Cambridge said. “I realize that Admiral Janeway is accustomed to multitasking, Lieutenant, but that’s a tall order,” Cambridge observed. “No, they can’t,” Torres corrected him. “Or until they shut down their entire communications array and perform a hard reset,” Torres noted. Chakotay stared at Decan’s implacable face. Although Voyager’s captain had known Kathryn longer and much better than her aide, Decan had been by her side constantly throughout her negotiations with the Confederacy. His observation struck Chakotay as significant, and he was frustrated that he could not yet make the connection it seemed Decan already had. “Why did Admiral Janeway insist on this?” Chakotay finally asked. “It is my belief that the admiral intends to resolve this situation long before her trial can conclude,” Decan said. Admiral Kathryn Janeway should have spent the last several hours reviewing her memories of Voyager’s first encounters with the Turei, the Vaadwaur, the Devore, and the Voth. Instead, she could not stop thinking about a kiss. When Decan had told her of his telepathic sense that Devore Inspector Kashyk was literally of “two minds,” internally divided between ancient rage and a desire to see Kathryn safe, the final piece of the puzzle she had tried to solve for weeks—ever since she had learned of the alliance between the Devore, the Vaadwaur, and the Turei, and the actions of the Voth against her fleet’s communications relays—had finally locked into place. Lieutenant Barclay had been obsessed for months with locating their rogue hologram, “Meegan.” Janeway had added this concern to her lengthy to-do list upon assuming command of the Full Circle Fleet, and it had rested in the back of her mind until it was forced out of the shadows by Decan’s revelation. The only plausible explanation for the recent alliance between these four familiar, hostile, and xenophobic species was some powerful outside influence, and an ancient species with access to all of Voyager’s databases that could possess high-level individuals at will was an incredibly likely candidate. Janeway had asked Lieutenant Lasren to accompany her to the Manticle, and his subtle nod before he departed had confirmed what the kiss with which she had greeted Inspector Kashyk had already told her. She had kissed him once before. It had been a spontaneous gesture, born of the closeness that had developed between them over several days and nights when they had seemed to share a common goal and purpose. But it had also been a test. Hers might not have been the most experienced lips in the galaxy, but they had assured her of Kashyk’s genuine response. The heat and desire in that kiss had been unmistakable. His heart, of course, had never been hers. The truth of the second kiss had been more painful than the first. The moment their lips had touched in the Manticle’s shuttlebay, Janeway had felt Kashyk’s desire once again, but this time there had been urgency, desperation to it. The sensation had vanished too soon as his lips had hardened and rough hands had pushed her away. Decan had been right. Kashyk was still there, but he was no longer controlling his mind or body. Her thoughts unwillingly returned to what little she remembered of her time as a Borg Queen. Some small shred of Kathryn Janeway had existed, secured in a cell within a mind that was no longer hers. From that cell she had witnessed atrocities. She had felt the Queen’s ecstasy. She had fought desperately to regain control, but it had been impossible. Despite the fact that Kashyk had been her enemy, she wondered if that was now his reality. If it was, he did not deserve it. No sentient being did. That the entity that now possessed Kashyk clearly wanted her dead was neither surprising nor relevant. Janeway could not hate Kashyk. She couldn’t even fear him. All she could do was pity him. The door to her “quarters” slid open and a Devore security officer flanked by two armed guards entered holding a set of heavy silver manacles. Lieutenants Psilakis and Cheng, her personal security team, rose and moved to stand between her and the Devore officer. “You will remain here,” he advised them. “No. That was not our understanding,” Psilakis said firmly. “It’s all right, Lieutenant,” Janeway said, placing a hand on his arm and gently pressing him back. She then lifted her eyes to meet the Devore officer and extended her hands to him, her palms upward. Her life might be over within a matter of hours. But until it was, a number of battles remained that must be won. Most of Chakotay’s interactions with the peoples of the Confederacy had been with Leodts like General Mattings: dark-skinned humanoids with black eyes, flattened noses, and mouths composed of a ring of sharp protruding teeth. Presider Isorla Cin was Djinari. The golden, diamond-shaped scales that covered her scalp did not seem to allow for a variety of facial expressions that might betray subtle reactions to his words. The long, thin tendrils that extended from the base of her neck were more fluid. They tensed and relaxed conspicuously, but Chakotay had yet to assign meaning to their movements. Cin had sat placidly behind an ornate, gilt desk in her receiving room aboard the Shudka and listened patiently while Chakotay had provided some much-needed context to the charges “Devore Inspector Kashyk” had made against Admiral Janeway and the Federation before the battle that had cost the Confederacy thirty-five of their ships and the Full Circle Fleet their admiral. The captain had not yet advised Cin that he believed Kashyk, and several of the other Kinara leaders, to be possessed by Neyser essences. The truth of Voyager’s first contact with the Voth, the Turei, the Vaadwaur, and the Devore Imperium should have been more than enough to convince Cin whose side she should take. The presider had seemed relieved by Chakotay’s recounting of Voyager’s encounters with the Delta Quadrant powers. She clearly wanted to believe that Admiral Janeway had been on the right side of these conflicts. She had cooled visibly, however, when Chakotay began to recount their introduction to the Devore, rising from her desk and pacing the room fitfully. “All has been done according to your orders, Presider,” Mattings reported. His voice was low and rough. It sounded to Chakotay as if the general was exhausted but refusing to admit it. The last time they’d spoken, Mattings had clearly been injured. But he had sworn to protect Chakotay’s people as his own. The captain had no reason to believe the general was not living up to that promise. “Very good, General,” Cin said. As soon as the words had left her lips, the doors to her suite opened and her Leodt first consul, Lant Dreeg, entered quickly and moved to stand directly in Cin’s line of sight. “The people of the Confederacy—” Dreeg began. Dreeg nodded warily and departed. As Chakotay watched him go, a newfound respect for Presider Cin took root. He had wondered up until now what might have caused Kathryn to risk so much on the Confederacy’s behalf. Finally, he was beginning to understand. “That remains to be seen,” Cin said. “Presider Cin, we are receiving a transmission from the Manticle,” the communication officer’s voice reported. “Put it through to my suite,” Cin ordered. Chakotay turned to face the large viewscreen that sat opposite the presider’s desk. It took every ounce of self-control he possessed to remain where he stood rather than returning to Voyager. Or better yet, arm myself with two phaser rifles and transport directly to the Manticle. This was the only location from which he could take the Confederacy’s temperature moment by moment. Once the trial began, their responses would be critical. His experiences with General Mattings had destroyed any confidence he’d once felt in his ability to predict Confederacy choices. He hoped that Kathryn had been wiser in her assessment of the presider. The doors to engineering were open as Lieutenant Harry Kim approached them, weaving through the constant flow of foot traffic with some difficulty. Officers and crewmen double-timed their way in and out, their hands heavy with freshly replicated replacement parts and tools. No one spoke in conversational tones. Orders, requests, and reports were shouted over the constant din and commotion. Despite the sense of chaos, their focus was singular: get Voyager moving again as soon as possible. Fleet Chief Engineer B’Elanna Torres stood in the eye of the storm, her face and uniform covered with grime, her hands flying over the main console stationed just beneath the combined warp/slipstream core that was the heart of Voyager. The ship’s chief engineer, Lieutenant Nancy Conlon, stood on the catwalk that circled the room’s second level just outside the doors of her private office, deep in conversation with two of her subordinates who had the good sense to simply nod quickly as she tersely issued their orders. Kim caught Conlon’s eyes as he headed toward the central console without distracting her from her current duties. A smile so faint he might have imagined it crossed her lips. Kim felt his own face soften a bit and nodded in response without missing a step. On any other day, the speed, precision, concentration, and devotion Kim saw before him would have buoyed his confidence in his ship. Today, they merely reinforced the fragility of Voyager’s current predicament and reminded him how close they had just come to annihilation. “B’Elanna,” he said softly, certain she was already aware of his presence. “What is it, Harry?” she demanded without lifting her eyes from her console. She turned sharply to face him. “Have we sent our transmission?” Torres asked. Torres’s face hardened. Kim wondered why she wasn’t already moving to join him in the briefing room. What other possible response was there? We are currently hanging dead in space surrounded by hostile alien vessels. Until I can get our shields restored, we are too vulnerable for me to leave my post, Kim could hear her protest. “Maybe,” Torres agreed. “But if she isn’t . . .” Her words trailed off. “Hey,” Kim said, placing a hand on her shoulder. “Okay,” Kim said. His feet were noticeably heavier as they carried him back to deck one. Counselor Cambridge was the only senior officer waiting in the briefing room when Kim arrived. He had not taken any of the available chairs, but stood with his back resting against the bulkhead, his arms crossed over his chest, and his eyes glued to the large viewscreen embedded in the wall. Five individuals were seated on a raised platform behind a long table. Kim recognized three of them, the Voth Minister Odala, Devore Inspector Kashyk, and the Skeen commander, Rigger Meeml. The others were Turei and Vaadwaur officers who looked familiar, but Kim could not place them.